UPDATED: Sun., Sept. 3, 2017, 9:34 a.m.
NEW YORK – Before sunrise Monday, tens of thousands of costumed, paint-slathered revelers will gather on the streets of Brooklyn for a joyous Caribbean celebration rooted in emancipation. This year, though, they’ll be doing it behind police barricades and metal detectors. Brooklyn’s version of the Caribbean carnival, called J’ouvert, has been held for decades in the pre-dawn darkness on Labor Day, but there was serious talk of canceling the party this year because of violence accompanying the event. Even after stepped-up security last year, including the installation of light towers that cast blazing light on a party that traditionally begins in the dark, three people were shot in the crowd. Two died. 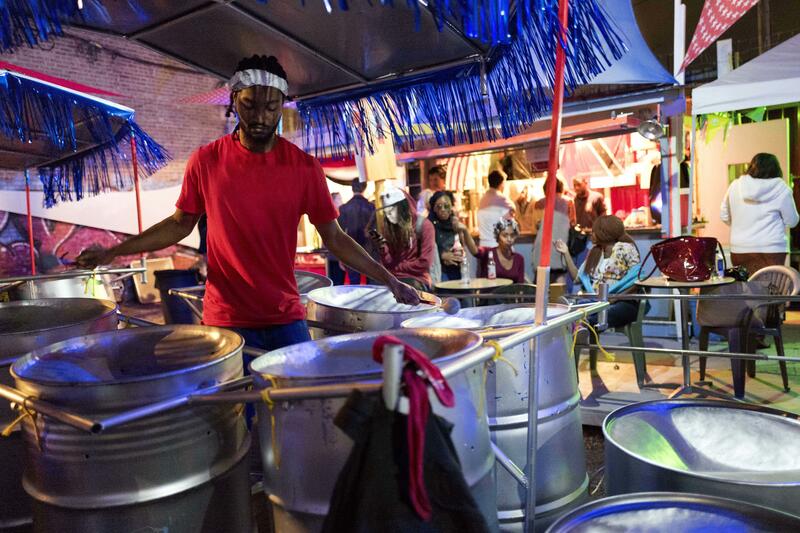 In response, city officials this year changed the start time of J’ouvert’s steel band procession from 4 a.m. to 6 a.m. and added strict security layers that don’t sit well with some longtime merrymakers. “Those of us really involved in J’ouvert are not creating this violence, and we shouldn’t be punished or forced to change,” said Michael Manswell, a dancer, choreographer and college professor who has attended for decades. The precautions, he and others predicted, likely won’t dissuade the devout from turning out early. He hoped it would discourage the troublemakers, who he said were people ignorant of the event’s meaning and just looking for an opportunity to create mayhem. “I can tell you I’m going out there either way, because I am committed to the mas,” said Manswell, referring to the costumed performances. The name J’ouvert means daybreak, put together from the French words “jour” and “ouvert.” It is the start of a carnival that includes the separate New York Caribbean Carnival Parade later Monday featuring “pretty mas,” or masquerade, revelers in giant feathery costumes riding on bright floats. J’ouvert’s costumes, called “ole mas,” are different but just as wild. Some people dress in rags and don helmets with giant horns painted a thick-as-molasses black. Others cover themselves in red paint or black oil. The costumes are a nod to the original celebrations that began in Trinidad in the mid-1800s when slaves were emancipated. Devils symbolize slave masters; revelers dress as political figures to mock them. People wear rags or pajamas because slaves had no proper clothes. Some don sailor costumes to mimic the U.S. Navy after World War II; they puff talcum powder into the air as both a nod to African rites and to the skin color of the sailors. But’s also a collective moment of letting off steam. The event began in New York in the 1920s in Harlem, when Caribbean people first started migrating to the city. Now, New York is home to the largest Caribbean community off the islands. It took a hiatus during the war years, and moved to Brooklyn. In the Caribbean, the celebration happens before Lent in the winter, but in Brooklyn it was moved to the end of August because the weather was better. “People were getting sick! They were dancing and sweating through their costumes and ending up with pneumonia, so when we came to Brooklyn, we moved it to the summer,” said Martin Douglas, 69, the president of the United States Steel Band Association and the leader of the Crossfire Steel Orchestra. Steel pan players practice for months for the event, as do performers who dance along with them. Groups are judged for their mas section and their music. At other celebrations in London, and even in Trinidad, the steel drums are drowned out by thumping sound systems. Shootings near the march route have long been a concern, but the violence got renewed attention in 2015, when an aide to Democratic Gov. Andrew Cuomo was killed by a stray bullet. Last year, 17-year-old Tyreke Borel was shot and killed and a 72-year-old woman was grazed in the arm. Soon after, a 22-year-old woman, Tiarah Poyau, was shot in the head just a block away and also died. This year, revelers must enter the route along 12 designated entry points and will have to pass through metal detectors, and no alcohol or backpacks will be allowed. Thousands of additional officers will be on patrol and will police party areas outside the barriers. Participants say while the event may not have the nostalgic touch, they’re pleased it will go on. Published: Sept. 3, 2017, 9:33 a.m. Updated: Sept. 3, 2017, 9:34 a.m.